We still have just under 3 weeks of regular season baseball left to play, it’s not quite football season yet! The National League is totally up for grabs. The Central can be won by any of three teams. The East by the Mets or Phillies. The West by any of four teams. What a race! With all the competition, who is the National League’s MVP? I will list the top candidates and give you my pick for the NL MVP. David Wright (3B Mets) – Here is the pick that you will most commonly see. Wright is a great option for the NL MVP. He is hitting .316/.411/.544 with a career high 28 homers, 35 doubles, 96 RBI, 98 runs, 31 stolen bases, and a 86/108 BB/K rate. Wright could, and should, win the gold glove at 3B. Wright kept the offense going while Carlos Beltran was out of the lineup due to injury and he has tore it up in the 2nd half (.355/.470/.609 and a 45/35 BB/K rate) with Jose Reyes struggling and hitting .258 since the break. Wright has carried the team on his shoulders but I tend to remember the team carrying him when he struggled at the beginning of the season. Chase Utley (2B Phillies) – Utley has missed some time due to injury and if not for that missed time I think we would be looking at the NL MVP. He is hitting .338/.417/.565 with 18 homers, 43 doubles, 92 RBI, 86 runs, 9 stolen bases, and a 46/75 BB/K rate. He leads the league in AVG and is second in OBP. He plays a physically demanding postion up the middle and holds his own. The knocks on Utley are that he has a lineup around him and that he his home stats carry his total stats (.384/.458/.643 with 12 of his 18 homers). But imagine where teh Phillies would be if he never got hurt. Matt Holliday (LF Rockies) – If the Rockies squeek their way into the playoffs this guy could easily win the award. Holliday is hitting .335/.396/.586 with 29 homers, 46 doubles, 5 triples, a league leading 191 hits, a league leading 116 RBI, 100 runs, 11 stolen bases, but a not-to-great BB/K rate of 52/111. Holliday also has improved his defense in left. The knock on Holliday will always be that he plays in Coors but he has hit .306 with 51 RBI on the road this season. If the Rockies miss the playoffs expect Holliday to finish in the 5-8 range in the MVP voting. Prince Fielder (1B Brewers) – You want power numbers for your MVP? Fielder is your man. He has hit to the tune of .290/.387/.616 with a league leading 44 bombs. He has also driven in 105, scored 96, hit 33 doubles, and has a good BB/K rate for a power hitter at 72/105. The Brew Crew have had a hard time keeping the lead in the Central and Fielder could lose votes for that. He could also lose votes due to the surrounding cast he has in rookie Ryan Braun (tied for 5th in homer with 30 in only 388 at-bats), Corey Hart (hitting .297/.355/.536 and is a 20/20 guy), and J.J. Hardy having a career year at SS with 24 homers. But let’s not forget that Bill Hall is having a down year with only 13 homers and a .258 AVG. And Rickie Weeks has been injured and been sent down to AAA. Fielder is a good option for MVP. 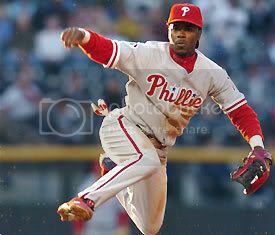 Jimmy Rollins (SS Phillies) – If I had a vote it would go to Rollins. He has been the one constant in the Phillies lineup. While Ryan Howard was out he hit. While Utley was out he hit. While Pat Burrell sucked he hit. While the bullpen was blowing saves. While the bullpen and rotation were injured. While… wait, I think you get my point by now. Overall Rollins is hitting .295/.346/.532 while leading the league in runs scored at 125, triples at 17, at-bats with 633, tied for the lead in extra-base hits at 80, and third in hits with 187. He is second amongst shortstops in homers with 27, tied for the lead in RBI with 82, third in doubles with 35, and third in stolen bases with 30. Like Wright, Rollins should also win a gold-glove if there is any justice in this world. In my opinion defense is way overlooked when it comes to MVP voting and it should factor in. Now, imagine where the Phillies would be without Rollins. Albert Pujols (1B Cardinals) – .321/.424/.562 with 30 homers, 31 doubles, 89 RBI, 88 runs, and a ridiculous 90/56 BB/K rate. Russ Martin (C Dodgers) – .297/.378/.475 with 17 homers, 30 doubles, 21 stolen bases, 81 RBI, 80 runs, and 60/79 BB/K rate. Chipper Jones (3B Braves) – .330/.416/.598 with 25 homers, 39 doubles, 87 RBI, 93 runs, and a 70/70 BB/K rate. Eric Byrnes (OF Diamondbacks) – .297/.367/.487 with 21 homers, 28 doubles, 8 triples, 81 RBI, 94 runs, 45 stolen bases, and a 56/89 BB/K rate. Even though Chase Utley missed one month with a broken hand, he is the top MVP candidate. His numbers are outstanding and is among the tops in most catagories, but his leadership, glove/defense and clutch performances set him apart from all contenders. This guy took a pitch on the hand that broke bones. His comback was remarkable. Chase was Charlie Manuel’s right hand man/asst. mgr. while hurt and present in the dugout. He studies more film than any MLB I can think of, plus his unselfishness and team play and leadership also set him apart from the rest. Numbers plus intangibles equals Utley as MVP.